The joke is obviously on me because I spent quite a bit of quality time wearing Les Jeux sont Faits by Jovoy Paris without ever realizing that it is supposed to be a tough guy's perfume, an homage to the anti-heroes of 1960s French cinema who played crooks and gamblers. It's about cheap booze, gambling tables in smoky back rooms and guys who really don't look like Alain Delon. I knew what were the notes, more or less, and I also researched the name, Les Jeux sont Faits ("gamble is made" meaning "chips are down"), which took me to a more or less romantic story of Paris in the 1940s. But not until I visited Jovoy's website and did I realize that the fragrance was slated as a very masculine one. Les Jeux sont Faits was released last year as part of the very impressive new incarnation of Jovoy Paris as a perfume house (it's also a wonderful store for niche perfumes). The perfumes are all new (released in 2011 and 2012), housed in beautiful bottles and projecting a certain determination and sophistication that were lacking before (you may remember the colored orb bottles of the perfumes that had generic names like Hespéridé, Fougère, Chypre, Marine, Poudré, Oriental and Boisé). Les Jeux sont Faits starts with a blast of bitter notes, a massive serving of booze and some dirty labdanum that peeks under them and stakes a claim on my skin from the very beginning. Skin chemistry is the most talented perfumer, and mine takes everything Jovoy and perfumer Dorothée Piot serve and warm it up considerably. I smell my skin-- only amplified-- and quite a bit of dry tobacco and somewhat austere wood, as well as an incensy effect that I absolutely love. As the dry-down approaches the bitterness is gone in favor of a sweet patchouli-labdanum-vanilla combo that I find irresistible. Is that what the people of Jovoy mean when they talk about "charismatic crooks"? I have no idea. But super masculine or not, Les Jeux sont Faits is as delicious as it is strong and tenacious. Notes: Petitgrain, Angelica, Dry fruits, Rum, Gin, Cognac, Tobacco leaf, Cumin, Sandalwood, Labdanum, Vanilla, Patchouli. Jovoy Paris- Les Jeux sont Faits (80 euro, 50ml) is avilable online from jovoyparis.com and by phone from Henri Bendel in NYC, the place that is still not sure about that internet thing. The smaple for this review was obtained at the last Elements show. 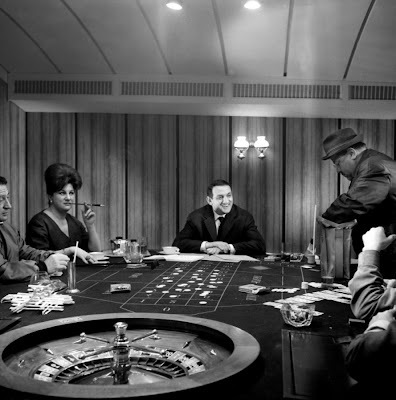 Photo from the 1963 movie Les Tontons Flingueurs via toutlecine.com. Back in the '70s, I had to read Sartres' Les Jeux sont Faits, which you link to, for high school French, and yet again when I took French in college. I wonder if they still use it to teach French in school. Maybe the idiom has tough-guy associations.